Is it me, or are popular gaming terminologies such as rogue-lite, Souls-like and Metroidvania starting to become increasingly overused? The Nintendo eShop is littered with them, every other game on Steam seems to be one of them and a big chunk of the indie scene is heavily inspired by them. Now, I’m not hating on any of these genres – quite the opposite, in fact. I’m more worried that when a style gets thrown around so loosely, it’s easy to become numb, discouraged or just simply turned off by it. Nevertheless, this latest rogue-lite Metroidvania (or Roguevania, according to developer Motion Twin) brings Souls-like elements across procedurally-generated dungeons to the Nintendo Switch. Does that all sound familiar and generic enough for you? Now, what if I told you that, in spite of what I mentioned above, Dead Cells could potentially be my favourite game of 2018. So, what makes this particular offering different from the rest? Well, it’s not necessarily what it does differently, it’s more the case of how well it does it. In this regard, Dead Cells goes above and beyond any expectations I had for this highly anticipated action-platformer. I never had the chance to play it in early access on Steam since its release last year, but I have been vaguely aware of it for quite some time. You begin each run as a ball of green gore rolling its way towards a lifeless, decapitated corpse that suddenly springs into action. At first glance, the game looks like a standard, yet visually pleasing pixelated slash ’em up. However, take the main protagonist out for a spin and you will soon begin to see just how flawlessly it all moulds together. You start with little more than a rusty old sword and the choice between a wooden shield or a standard bow. Attacking enemies is executed with a simple spam of a button, while firing off your limited quiver of arrows can jam into an enemy’s body until they either die or simply fall out of them to let you automatically reload your weapon. Rolling past a foe is your main source of defence unless you have a shield that will parry an attack if timed correctly. The final, and very useful, starter move in your arsenal is the ability to drop down from wooden floors with a fast and powerful slam, causing damage to any enemies lurking underneath you. When all mixed together you become a relentless killer, tearing through the opposition in the most stylish and satisfying way you could have ever asked for. What shapes the combat even further is by how incredibly responsive the controls are. The character’s double jump has a sort of Super Meat Boy tightness in navigation that works gracefully with the river-rapid fluidity of the move set. What makes the whole process gel together even more is in how you begin to study and learn the attack patterns of your enemies. Once you have honed in on the easy to learn control system, you will soon be busting your way through areas like an angry Ronin on a revenge trip. With a little practice and after acquiring some permanent rune upgrades, you may even begin to zip around the environments at a blistering pace like a webless Spider-Man corrupted by the Venom Symbiote. On top of that, these are only the beginning of possibilities available to you. Possibilities that seem almost endless. As there are no lives, checkpoints or continues to rest on, every failed attempt throws you right back to the beginning of the game in a nightmarish Groundhog Day loop. This doesn’t mean that I ever felt that my last run was for nothing, nor did I ever mind working my way back through the early levels over and over again. You see, just like any good rogue-lite adventure, you can collect powerful weapons and perks to fill your limited slot space to help you along the way. Many of these such items are crafted from collectable blueprints using cells that an enemy may drop. However, there is a catch. Should you meet your demise during a level, you lose the cells that you have gained within them. This results in missing out on your payments for certain blueprints that you have been eyeing up. Cells that are already cashed in towards these blueprints do carry over, thankfully, but many of the items and weapons that are forged from them aren’t available to you at the start of each run. The amount of surprises and secrets in store does more than enough to constantly keep the player intrigued and hopelessly invested. Deciding whether you want to upgrade between your survival, brutality or tactical stats keeps choices catered around your run with a strategic mindset. The same can also be said when finding and combining the qualities of your primary and secondary weapon layout. Some of these weapons may even have an additional bolt-on to compliment the effects from one another. This gives you an incentive to play with different combat styles and weapon concoctions outside your usual preference. As a result, it’s a game that constantly keeps emotions at a high as you aggressively work your way to through the Metroid-style map system armed to the teeth with a John Wick confidence. That is, of course, until you venture into untapped territory only to tiptoe in fear or be met with a situation where you must run for your life. It’s these cautious moments that keep the tension at a constant, for the idea of losing everything you have earned is always painfully unnerving. Needless to say, the challenge here certainly is tough, but it’s all so well balanced that it never feels impossible. As for presentation, Dead Cells is a gorgeous looking game with vibrant backgrounds that bleeds with a visual but vague story to tell. The technology of the graphics themselves are actually made up using 3D models converted into two-dimensional pixelated sprites then set into frames of animation. The end result is a game that’s great to look at, shotgunned by buttery smooth animations. The procedurally generated levels are excellently implemented here, too. Every run feels fresh no matter how many times you play through them, especially when combined with the vast amount of permanent or temporary upgrades and alternative pathways on offer. The audio that wraps it all together was the tasty little cherry on the top for me. The sound effects assist in the sense of weight, accompanied with background music that fits gracefully within each stage. Listening to the stroke of acoustic strings during the first level reminded me of Gerudo Valley from The Legend of Zelda: Ocarina of Time – a quite fitting melody when sprinting to escape the dreaded prison cells where the fateful, headless hunter constantly restarts his journey. While there isn’t a lot of content in regards to actual storytelling, believe it or not, there’s a lot that I have left out of this review with the intention not to spoil what’s in store. What I will tell you is that the more I played Dead Cells the tighter its relentless grip got hold of me. It’s an experience full of surprises and curiosities that will undoubtedly kill you for trying to uncover its secrets. It’s a prime example of taking a handful of quality ingredients and conjuring something up that’s nothing less than exquisite. This isn’t just a Roguevania with Souls-like elements clasping it together. 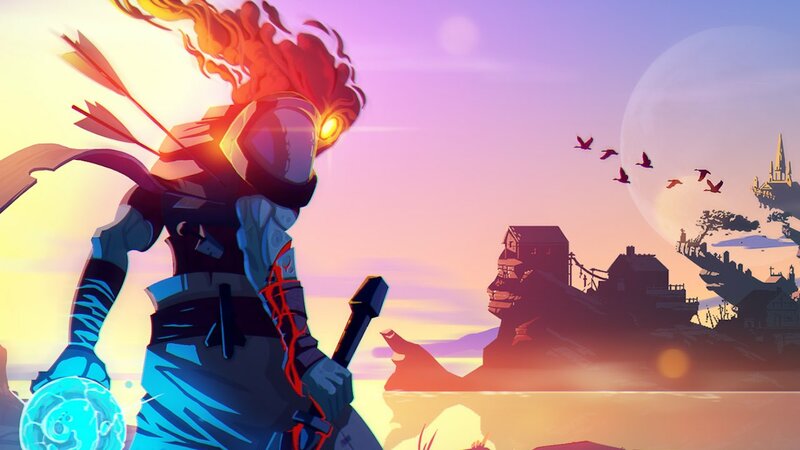 Dead Cells is a modern-day classic that absorbs the knowledge and spirit of the games that originally coined the terminologies in the first place.